Introduction: The objective of the study is to evaluate and compare the vertical root fracture resistance of maxillary central incisors filled with different root filling materials and sealers. Materials and Methods: Sixty freshly extracted maxillary central incisor were decoronated 2 mm above the cementoenamel junction and were instrumented using K-flex files. Teeth were divided into four experimental groups and two control groups of ten each and root filled as Group A - Gutta-percha master cone and AH Plus sealer, Group B - Gutta-percha master cone and RealSeal sealer, Group C - RealSeal master cone and RealSeal sealer, Group D - RealSeal master cone and AH Plus sealer, Group E - roots were instrumented but not filled (negative control group), and Group F - roots were neither instrumented nor filled (positive control group). 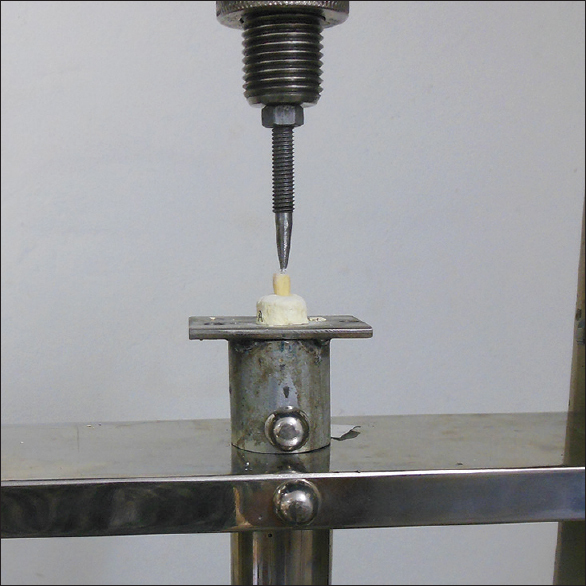 Restored teeth were subjected to compressive loading in a universal testing machine. Results: Group C showed highest fracture resistance among other groups, followed by Group F, Group D, Group B, and Group A. Group E showed the lowest fracture resistance value. According to an independent sample t-test, significant difference was found between Group A and Group C (P = 0.038), Group A and Group F (P = 0.048), Group B and Group C (P = 0.039), Group C and Group E (P = 0.024), Group D and Group E (P = 0.038), and Group E and Group F (P = 0.034), and the results were nonsignificant among other groups. Conclusion: The higher fracture resistance was seen in roots obturated with RealSeal system compared with Gutta-percha-AH 26 groups on vertical loading. Keywords: AH-26; epiphany; Gutta-percha; lateral condensation; resilon. Root canal treatment leads to decrease in fracture strength of teeth., The tooth structure also gets weakened due to root canal instrumentation and dehydration as a result of irrigating solutions., Thus, the main aim of the obturation is to reinforce the root canal dentin, thereby increasing the fracture resistance. Root canal treated teeth present with vertical root fracture (VRF) as complication which may result in extraction., VRF extends longitudinally through the complete thickness of dentin from root canal to periodontal ligament. Fractures may result from undue lateral condensation forces during obturation  and restorative procedures, following root canal treatment. Sealers require lateral and apical seal for good adaptation to the root canal dentin. Root canal sealers which bond to root canal dentin increase the fracture resistance and reinforce the root canal-treated teeth. In spite of being the standard root canal filling, Gutta-percha lacks adhesion to the internal tooth structure which leads to the absence of complete seal. Bacterial microleakage may occur due to this poor seal. Resilon ® is a resin-based obturation material that incorporates adhesive technology, and it improves the leakage resistance of the material. It is used with a dual-cured polymer-based composite sealer. Recently, Resilon ® and the associated sealer along with a self-etch primer has been introduced. The Epiphany ® Soft Resin Endodontic Obturation System (Pentron ® Clinical Technologies, LLC, USA) includes a choice of Resilon ® points or pellets as the core filling material, which facilitates the use of both lateral and vertical compaction techniques. The root filling can be bonded to the root canal using either the original Epiphany ® Sealer to be used with Epiphany ® Self-Etch Primer or a new Epiphany ® SE Self-Etch Sealer. Resilon system has several properties such as sealing ability due to monoblock formation, adequate bond strength of resilon to dentin, fracture resistance, faster and easier removal in case of re-treatment of resilon-filled canals, and lesser cytotoxicity can be easily disinfected, softened, and dissolved with solvents. Therefore, the objective of the present in vitro study is to evaluate and compare the VRF resistance of maxillary central incisors filled with different root filling materials and sealers, i.e. Gutta-percha/AH-26 Plus, and Epiphany ® Soft Resin Endodontic Obturation System (Pentron ® Clinical Technologies, LLC, USA). 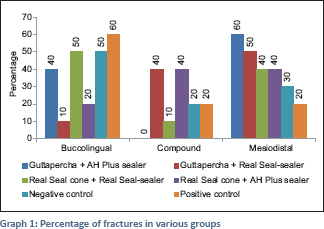 The null hypothesis tested was that there is no difference in the fracture resistance of teeth filled using different filling materials and sealers – Gutta-percha/AH Plus sealer, Gutta-percha/RealSeal sealer, RealSeal master cone/RealSeal sealer, and RealSeal master cone/AH Plus sealer. Sixty freshly extracted maxillary central incisors were collected from patients' age between 46 and 60 years having advanced periodontitis and stored in normal saline with thymol throughout the study. All the teeth were decoronated 2 mm above the cementoenamel junction (CEJ) using a diamond disc to provide approximately 16 ± 1 mm of root length. Maximum buccolingual diameter of root was in the range of 5 + 1 mm. The entire length of the root was measured by introducing smallest size 10 K-file up to the apical foramen corresponding to its apical diameter. After evaluating patency of canal, working length was established 1 mm short of apical foramen. The teeth were instrumented using K-flex files up to size 45 Master apical file by step-back technique and canal was flared up to size 80. The coronal third was prepared using sizes 3 and 4 Gates Glidden drills. Irrigation was done using 2.5% sodium hypochlorite solution, followed by flushing with 17% ethylenediaminetetraacetic acid and 5.25% sodium hypochlorite to remove the smear layer. The canals were dried using sterile paper points. Teeth were divided into four experimental groups and two control groups of ten each and obturation was done as follows. Group A - Gutta-percha master cone and AH Plus sealer, Group B - Gutta-percha master cone and RealSeal sealer, Group C - RealSeal master cone and RealSeal sealer, Group D - RealSeal master cone and AH Plus sealer, Group E - roots were instrumented but not obturated (negative control group), and Group F - roots were neither instrumented nor obturated (positive control group). Cold lateral compaction technique was used for obturation, and the sealers were applied following manufacturer's instructions. AH Plus sealer was applied to the canal wall using master apical file. In case of RealSeal sealer, microbrush was used to coat the canal, and the excess primer was dried with paper points. The sealer was carried using the master cone and placed with gentle apical pressure, followed by finger spreader to compact it. Then, a fine accessory cone was placed, and the process was repeated until the canal was filled completely. Obturation materials were removed 2 mm apical of CEJ and condensed vertically using hot plugger. The roots in Group B and Group C were light cured for 40 s. The access opening was sealed with cavit. All the teeth samples were directly tested for fracture resistance immediately after obturation. Each root was coated with silicon paste to simulate periodontal ligament and then vertically mounted on a polyvinyl chloride ring having dental stone to 2 mm below CEJ. A medium-sized finger spreader was customized and fabricated in the laboratory centering over the canal orifices on the teeth samples and then mounted on universal testing machine [Figure 1]. The spreader was aligned with the center of the access opening of each specimen, and a vertical loading force was applied at the speed of 0.5 mm/min until the root fractured. The amount of force required to fracture the roots was recorded in Newton. The types of fracture occurred in all the root samples were noted down, and percentage of fractures for various groups was tabulated and statistically analyzed by the statistician [Graph 1]. The data were analyzed statistically using one-way ANOVA and an independent sample t-test. 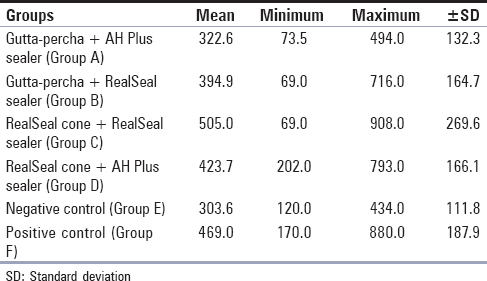 The highest mean fracture resistance values were seen with RealSeal system (505 + 269.6 N), followed by positive control group (469 + 187.9), RealSeal cone + AH Plus sealer (423.7 + 166.1 N), Gutta-percha + RealSeal sealer (394.9 + 164.7 N), and Gutta-percha cone + AH Plus sealer (322.6 + 132.3 N), and the least fracture resistance value was observed with negative control group (303 + 111.8 N) [Table 1]. 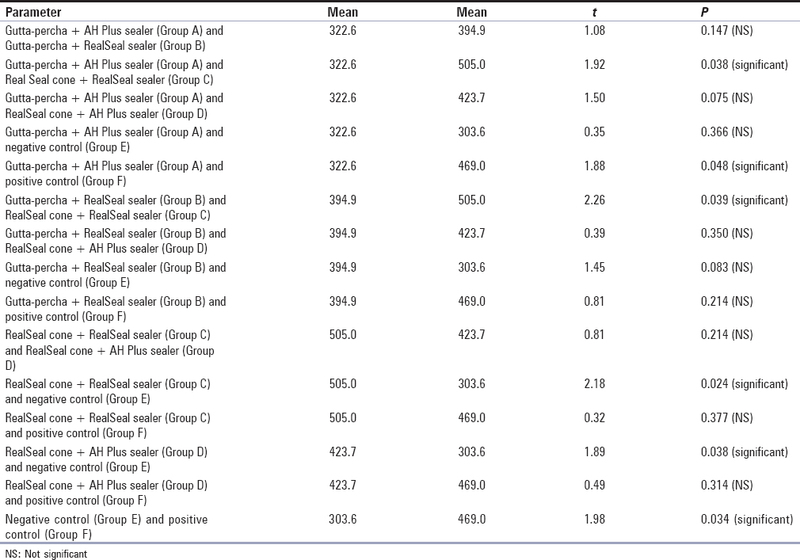 According to one-way ANOVA, there was significant difference among the experimental groups (P < 0.05) and control groups (positive and negative control groups) [Table 2]. According to an independent sample t-test, significant difference was noted between Group A and Group C (P = 0.038), Group A and Group F (P = 0.048), Group B and Group C (P = 0.039), Group C and Group E (P = 0.024), Group D and Group E (P = 0.038), and Group E and Group F (P = 0.034), and the results were nonsignificant among other groups [Table 3] and [Table 4]. According to various studies, all endodontic procedures render the endodontically treated teeth weaker than their vital counterparts due to various reasons such as dehydration of dentin after endodontic therapy, excessive pressure during obturation, and removal of tooth structure during endodontic treatment. Lateral condensation results in generation of stresses leading to VRF (Tamse 1988, Meister et al. 1980). VRF can be created experimentally by generating forces within the root canal with the help of spreader placed inside the root filling. In this method, force is distributed from inside the root, and forces are transmitted through the obturation material to the walls of the canal leading to fracture. The prevalence of VRF was reported to be in a range from 11% to 20% in root canal-treated teeth. VRF is diagnosed usually many years after completion of all endodontic and prosthodontic procedures. The fractures which occur intraorally and those induced experimentally using a testing machine have many differences because forces generated inside the mouth during function vary in duration, magnitude, and speed. When the forces are applied vertically to the long axis of the tooth, they are uniformly transmitted (Khan et al. 2015, Nagpal Ravi et al., 2012, Teixeira et al. 2004). Hence, for this study, force was vertically applied as for other similar studies (Endodontology, Teixeira et al., 2004, Lertchirakarn et al. 2002, Hammad et al. 2007). The VRF presents with deep osseous defects especially on the buccal aspect of the maxillary and mandibular premolars and mesial roots of the mandibular molars and highly located sinus tract. The most frequent radiographic features of VRF are the “halo” appearance as a combined periapical and perilateral radiolucency on one or both sides of the root, lateral periodontal radiolucency along the side of the root, or angular radiolucency from the crestal bone which terminates along the root. It is believed that some VRF begins during root canal instrumentation and filling and progresses to more extensive fracture with time and occlusal load. Studies have shown that fracture resistance decreases upon removing the tooth structure. The root gets weakened upon removal of dentin due to access cavity preparation, cleaning and shaping of the canals. Some studies have quoted the ability of different root canal filling materials to significantly strengthen the roots, where other investigators found that these materials did not increase the fracture resistance of root-filled teeth. Hence, adhesive dental materials are now available that may offer an opportunity to reinforce endodontically treated tooth through the use of adhesive sealers in the root canal system. In the present study, adhesive root canal sealers, AH Plus and RealSeal sealer have been used because of their root reinforcement properties. Resilon performs similarly as Gutta-percha performs in a GP, has the same handling properties, and for retreatment purposes may be heat softened or dissolved with solvents such as chloroform and xylol. In case of resilon, the coronal 2 mm of the canal is light cured for 40 s and the entire filling gets self-cured in about 15–30 min. It is slightly stiffer than Gutta-percha. Resilon can be thermoplasticized at low temperature and obturated using different obturation techniques including lateral compaction, vertical condensation, heat softened, i.e. thermoplasticized technique (obtura II and system B) and injected into the root canal system. The sterilization protocol of resilon is similar to Gutta-percha, i.e. 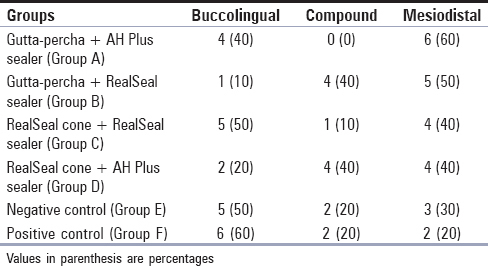 by placing in a suitable disinfectant for 60 s.
In this in vitro study, Group C (RealSeal cone + RealSeal sealer) showed highest fracture resistance among other groups, followed by Group F (positive control group), Group D (RealSeal cone + AH Plus sealer), Group B (Gutta-percha cone and RealSeal sealer), and Group A (Gutta-percha cone and AH Plus sealer), and Group E (negative control group) showed the least fracture resistance. Thus, the null hypothesis was rejected. The negative control group (Group E) in which the teeth were instrumented but not obturated showed less fracture resistance than the resilon group due to lack of reinforcing obturating material. The control group showed greater fracture resistance than teeth in Gutta-percha group due to lack of generation of forces due to lateral condensation. The positive control group (Group F) in which roots were neither instrumented nor root filled showed higher fracture resistance values than other Groups A, B, D, and E. This may be because of weakening of root canals due to instrumentation, and sufficient strength could not be achieved after obturation. A large clinical trial is required to confirm the accuracy of this in vitro study. The majority of the samples, i.e. 40% (24 of 60), fractured in mesiodistal direction, 38.3% samples (23 of 60) fractured in labiolingual direction, and remaining 21.6% samples (13 of 60) fractured as compound fractures in the present study. The results of the present study were in accordance with studies done by Carlos et al. 2014, Ashraf et al. 2013, Khan et al. 2015, Shiraguppi et al. 2015, and Kumar et al. 2014. Resilon and epiphany form “monoblock” and this increases fracture resistance due to close adaptation of resilon filling to epiphany sealer. Epiphany sealer adheres to the root canal walls of dentin holding the root together and decreases microleakage. Hence, the bond between polyester core material and dual-cure methacrylate-based sealer increases the fracture toughness of resilon-filled roots. This observation is also in accordance with studies done by Shashidhar and Shashidhar 2014, Jeanne Monteiro et al. 2011, Teixeira et al. 2004, Khan et al. 2015, Kiran Halkai et al. 2014, Kumar et al. 2014, Hammad et al. 2007, and Carlos et al. 2014. Piskin et al. conducted a study  in which the spreader size >25 number decreases fracture resistance of roots. Lertchirakarn et al. stated that excessive lateral condensation forces result in fracture during the root filling. Lateral condensation produces wedging forces generated by spreader decreasing the fracture resistance in the Gutta-percha group, thereby increasing fracture susceptibility of root. The high fracture resistance values observed in our study as compared to other previous studies , may be due to the variable structures of root dentine of the tested samples relating to dentinal sclerosis or age. It is also seen that the weaker chemical coupling of resin-based sealer to resilon due to addition of insufficient or inappropriate amount or method of dimethacrylate in resilon does not produce predictable coupling. The clinical similarity between Gutta-percha and resilon groups according to this study showed highly statistically significant difference. The results of our study indicate that the monoblock formation resists bacterial permeation through the material, hold the roots together, leading to increased fracture resistance. Hence, this property of resilon could be the reason for the positive result in our study and the nonadhesive obturating materials showed poorer result. It is important to emphasize that these resin-based root canal filling materials are technique-sensitive, and it is difficult to compare the findings of this in vitro study to clinical condition because the adhesion of Resilon system is affected by several factors; failure for complete removal of smear layer or sufficiently adaption of the resinous sealer to root canal walls might interfere with its bonding in addition to the polymerization shrinkage of these resinous materials during setting. The high C-factor of root canals during polymerization of resinous endodontic sealers can lead to creation of gaps along dentine/filling material interface. During photo-polymerization, there is reduction of volume of monomer, which promotes shrinkage stresses subsequently debonding the material from dentine, decreasing the adaptation, and increasing microleakage. All of that might interfere with the bonding of these materials to dentine walls minimizing its supporting effect. It is important to mention that Resilon obturation system has not been evaluated to deeper level such as GP and conventional sealers. Further research is required in search for more advanced materials to increase the fracture resistance of endodontically treated teeth. Resilon with RealSeal sealer combination is the best material among the experimental groups and control groups to resist the post-obturation vertical fracture. This was an in vitro study and in vivo tissue responses were not taken into consideration. Furthermore, there are natural variations in the anatomy of human teeth which influence the strength of the roots. These variations were decreased by taking some factors such as equal root length and performing similar final size of canal preparation and by same allotment of maxillary central incisor in each group using stratified sampling and taking almost similar buccolingual and mesiodistal dimensions (JORAPID, 2014). Oliveira Fde C, Denehy GE, Boyer DB. Fracture resistance of endodontically prepared teeth using various restorative materials. J Am Dent Assoc 1987;115:57-60. Belli S, Cobankara FK, Eraslan O, Eskitascioglu G, Karbhari V. The effect of fiber insertion on fracture resistance of endodontically treated molars with MOD cavity and reattached fractured lingual cusps. J Biomed Mater Res B Appl Biomater 2006;79:35-41. Ulusoy OI, Genç O, Arslan S, Alaçam T, Görgül G. Fracture resistance of roots obturated with three different materials. Oral Surg Oral Med Oral Pathol Oral Radiol Endod 2007;104:705-8. Fuss Z, Lustig J, Katz A, Tamse A. An evaluation of endodontically treated vertical root fractured teeth: Impact of operative procedures. J Endod 2001;27:46-8. Teixeira FB, Teixeira EC, Thompson JY, Trope M. Fracture resistance of roots endodontically treated with a new resin filling material. J Am Dent Assoc 2004;135:646-52. Assif D, Gorfil C. Biomechanical considerations in restoring endodontically treated teeth. J Prosthet Dent 1994;71:565-7. Schäfer E, Zandbiglari T, Schäfer J. Influence of resin-based adhesive root canal fillings on the resistance to fracture of endodontically treated roots: An in vitro preliminary study. Oral Surg Oral Med Oral Pathol Oral Radiol Endod 2007;103:274-9. Apicella MJ, Loushine RJ, West LA, Runyan DA. A comparison of root fracture resistance using two root canal sealers. Int Endod J 1999;32:376-80. Gogos C, Stavrianos C, Kolokouris I, Papadoyannis I, Economides N. Shear bond strength of AH-26 root canal sealer to dentine using three dentine bonding agents. J Dent 2003;31:321-6. Mohammadi Z, Jafarzadeh H, Shalavi S, Bhandi S, Kinoshita J. Resilon: Review of a new material for obturation of the canal. J Contemp Dent Pract 2015;16:407-14. Lertchirakarn V, Poonkaew A, Messer H. Fracture resistance of roots filled with gutta-percha or RealSeal ®. Int Endod J 2011;44:1005-10. Wadwani KK, Gurung S. Evaluation of root canal sealers on the fracture resistance of root canal treated teeth - An in vitro study. Endodontology 2010;22:53-8. Tamse A, Fuss Z, Lustig J, Ganor Y, Kaffe I. Radiographic features of vertically fractured, endodontically treated maxillary premolars. Oral Surg Oral Med Oral Pathol Oral Radiol Endod 1999;88:348-52. Carlos RB, Makam S, Yaragonda VK, Murali H, Tyagi A, Rose R. Comparative in vitro Evaluation of Vertical Root Fracture Resistance of Endodontically Treated Teeth using Different Obturating Materials. World J Dent 2014;5:113-7. Rashmi NC, Basavanna RS, Gupta D. Influence of a resin based root canal filling material on resistance to fracture of endodontically treated teeth: An in-vitro study. Oral Health and Dental Management 2014;13:1013-17. Abdo SB, Eldarrat AH. Fracture resistance of overtly flaring root canals filled with resin-based obturation material. Dent Res J (Isfahan) 2013;10:59-64. Ashraf H, Momeni G, Moradi Majd N, Homayouni H. Fracture resistance of root canals obturated with gutta-percha versus Resilon with two different techniques. Iran Endod J 2013;8:136-9. Khan S, Inamdar MN, Munaga S, Ali SA, Rawtiya M, Ahmad E. Evaluation of fracture resistance of endodontically treated teeth filled with gutta-percha and Resilon obturating material: An in vitro study. J Int Oral Health 2015;7 Suppl 2:21-5. Shiraguppi VL, Shekar HB, Shivalingappa CG, Desai N, Azad A. Comparative Evaluation of Fracture Resistance of Root Obturated with Resilon and Gutta-Percha Using Two Different Techniques: An in vitro Study. Journal of Clinical and Diagnostic Research: J Clin Diagn Res. 2015;9:ZC15-8. Kumar P, Kaur NM, Arora S, Dixit S. Evaluation of fracture resistance of roots obturated with Resilon and thermoplasticized gutta-percha: An in vitro study. J Conserv Dent 2014;17:354-8. Piskin B, Aydin B, Sarikanat M. The effect of spreader size on fracture resistance of maxillary incisor roots. Int Endod J 2008;41:54-9. Hammad M, Qualtrough A, Silikas N. Effect of new obturating materials on vertical root fracture resistance of endodontically treated teeth. J Endod 2007;33:732-6. Tay FR, Hiraishi N, Pashley DH, Loushine RJ, Weller RN, Gillespie WT, et al. Bondability of Resilon to a methacrylate-based root canal sealer. J Endod 2006;32:133-7. Sagsen B, Er O, Kahraman Y, Akdogan G. Resistance to fracture of roots filled with three different techniques. Int Endod J 2007;40:31-5. Rosenstiel S, Land M, Fujimoto J. Contemporary Fixed Prosthodontic. 4th edition. St. Louis, Mo, USA: The Mosby; 2006. Shashidhar J, Shashidhar C. Gutta percha verses Resilon: An in vitro comparison of fracture resistance in endodontically treated teeth. J Indian Soc Pedod Prev Dent 2014;32:53-7. AH-26; epiphany; Gutta-percha; lateral condensation; resilon.